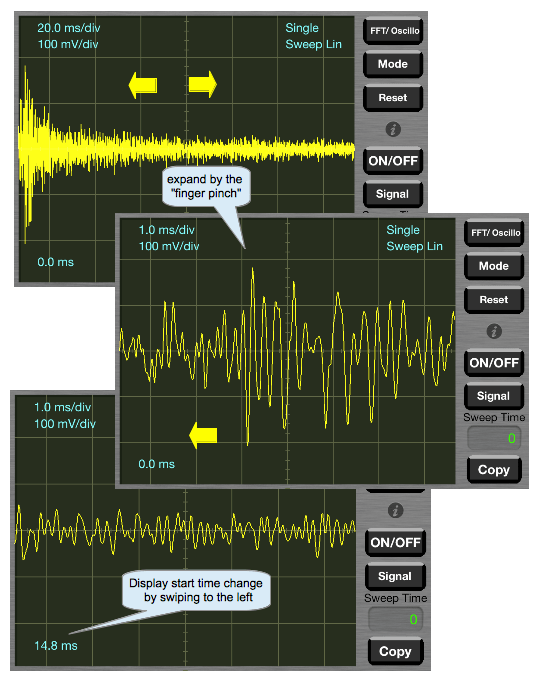 Three tools (oscilloscope, FFT analyzer (spectrum analyzer), signal generator) that is included in the e-scope 3-in-1. 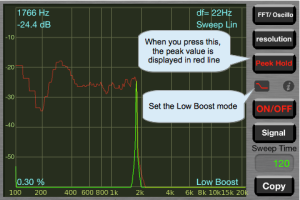 It is also observed in the frequency characteristics of the audio device using an FFT analyzer and signal generator. 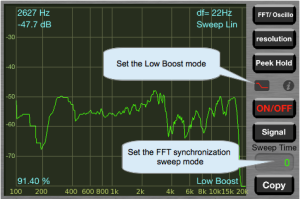 Observation of the frequency characteristics of the real time is possible by using the ‘FFT synchronization sweep mode’. Please look at this video. Unit of horizontal axis is ms/div, it shows the time of one per division. Unit of vertical axis is mV/div, it shows the voltage of one per division. However, please be used as the relative sensitivity when the microphone input. 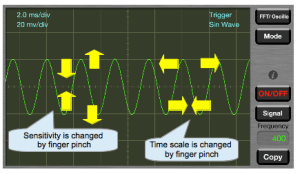 Change the time scale and sensitivity is possible using the finger pinch. 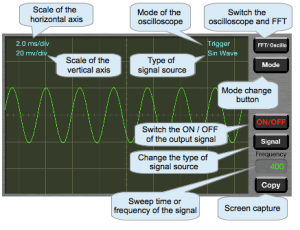 oscilloscope of ‘e-scope 3-in-1’ has three modes. normal mode:This is the basic mode.This mode is suitable for observing the music waveform. Trigger mode: This mode is suitable for repeated waveform such as sine wave, You can be observed in the stationary condition the waveform. Trigger level is set to 8% of the screen display. Display is not updated when the signal below this. 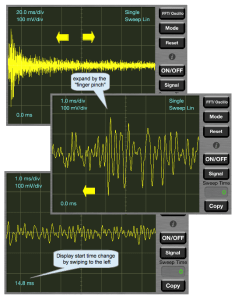 Singleモード：Single mode: This mode is suitable for observing the waveform of one-off, such as impact sound. When you switch to this mode, it is waiting for input as shown in the figure below. It can not change the time scale and sensitivity this state. 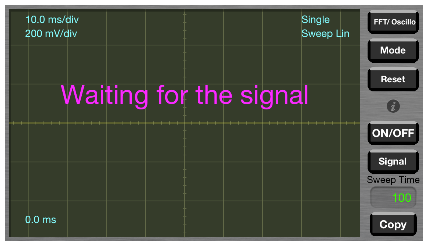 If there is a signal input, waveform displays a yellow. The recording waveform can change the size of the waveform and time axis by the “finger pinch”. Further, in a state in which an enlarged time axis, by swiping left and right, can be changed in time to start the display. To enter wait mode again, please press the Reset button. Waveform record will be cleared when you exit the app or change the mode. Please take a screen capture by pressing the Copy button. It is possible to analyze the frequency spectrum of the input signal. Peak level and frequency is displayed at the top of the screen, it can also be used as a simple frequency counter when you enter a single signal. In addition,display the THD (distortion) in the bottom left of the screen. 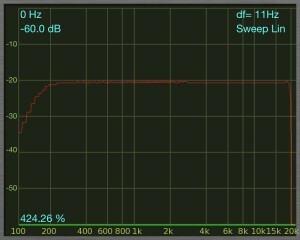 By pressing the resolution button, you can select the frequency resolution of the three types. 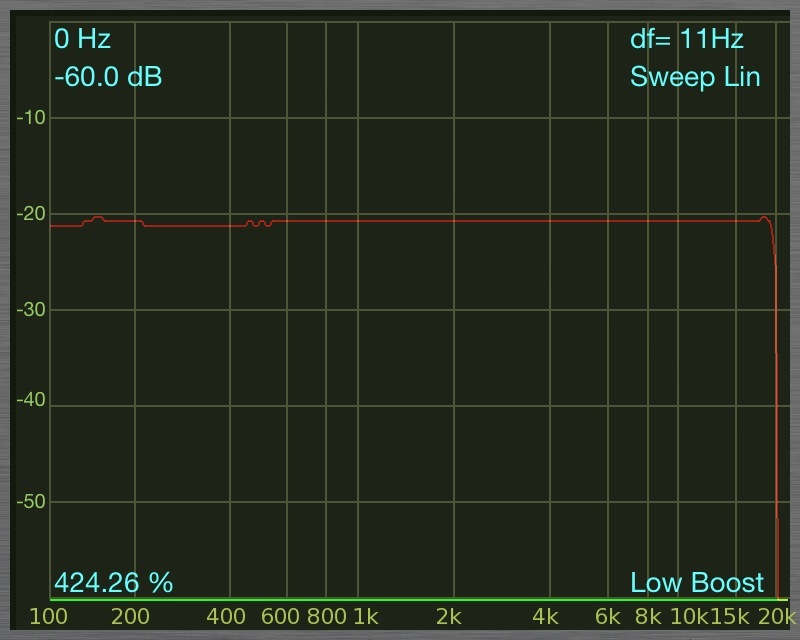 It is possible to change the sensitivity 10dB step by swiping up and down. When you press the peak hold button to hold the maximum value of the signal that you are currently viewing, they are displayed in red line. If you want to try again to clear the retention results, please press 2 times the peak hold button. The iPhone internal microphone amplifier, a filter for attenuating the low frequency enters. 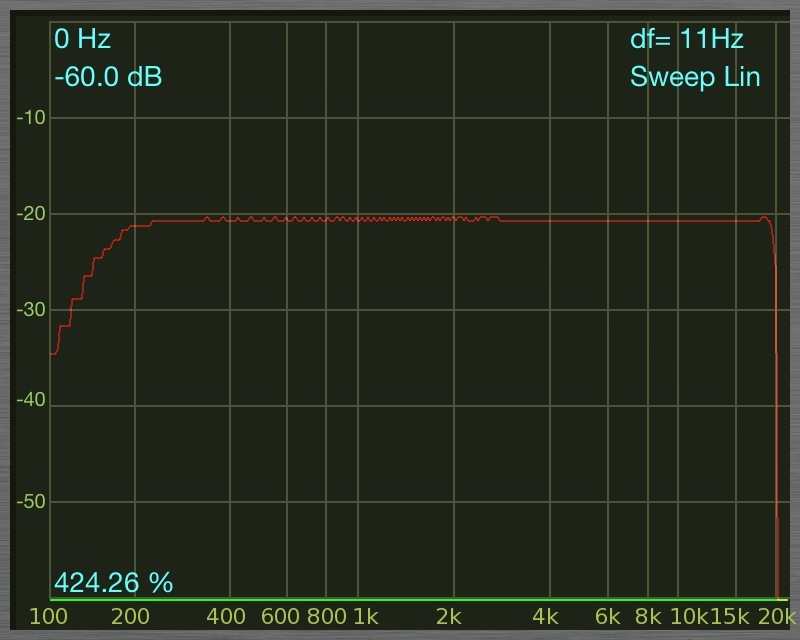 If you use the low boost mode, it is possible to compensate for this attenuation minutes, close to the flat characteristics. 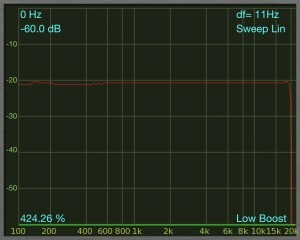 The above figure to measure the frequency response using the sweep signal and peak hold function.Takes a very long time. Below is the example image of FFT synchronization sweep mode. The signal generator can be used to generate a signal of four types. 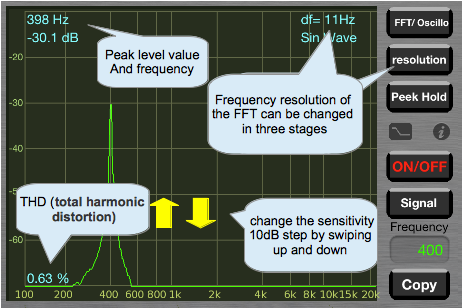 Sine wave of 1Hz ~ 20kHz,White noise,Linear sweep and Log sweep the frequency varies from 100Hz ~ 20KHz. When you tap the area that displays the frequency or sweep time, picker will appear. please set the appropriate number. 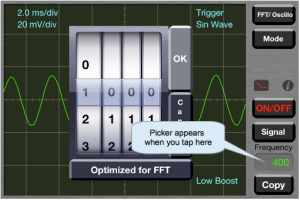 By using the mode [optimized for FFT], it can be automatically changed to a frequency FFT analysis accuracy is the highest. Please use if you want to accurately measure the THD. When the frequency display, it will be ignored when you enter the 0000. It is the FFT synchronization sweep mode when you enter the 000 at the time of the sweep time display. It is possible to observe in real time the frequency characteristic in this mode. When you press the Copy button, you can in all modes, and save to camera roll capture screen photo. Sampling frequency of the app is 44.1KHz. 1 frame number of samples of the FFT is three kinds of 4096,2048,1024(It can be switched with a resolution button). Window function of the FFT is rectangular(No filter). Frequency characteristics of the iPhone built-in microphone amplifier is included in the observation of the frequency response of this app. (Low-cut filter that attenuates the 200Hz or less seems to be inserted into the built-in microphone amplifier. 4-pole mini plug cable is required in order to connect to an external amplifier headphone jack output. When connecting to an external amplifier headphone output, in order to prevent the destruction of the speakers, etc., to keep down the volume of both always, please do turn up the volume gradually. For reference information about the external input cable. Thank you for helpful suggestions for improvement of app. Could you enable background audio so the signal generator will work when I’m using another app? Thanks! This app does not support background operation. When you start another app, the signal generator will stop working.